Here’s a quick and easy way to add a gradient into any synthetic heat resistant wig! You won’t be able to use just any wig with this method. The wig you choose needs to be synthetic and heat resistant, as well as a lighter color than your dye. I use a white wig for my example, but you can use other light colors as long as they are lighter than your dye. If it’s darker, the dye isn’t going to show up. Fill your stainless steel pot with enough water to dunk your wig in easily. I have mine filled less than halfway. You’ll also need to have a pot specifically for dyes. Dyes are not safe for consumption, so you do not want to use the same tools for dye as you use for food preparation. Then, heat the water on a stove top. The water needs to be hot, but I do not recommend heating it past boiling temperature. Wig fiber will dye more easily the hotter the water you use. so be aware of that as you proceed! Grab your dyes! It’s time to add color! Rit Dyemore is excellent for dyeing synthetic materials. For mine, I’m using Apricot Orange and Racing Red to make a light orange to dark orange gradient. With this method, you’ll need to start with your lightest color and work your way into your darkest color. Start by adding a small amount of dye to your water and mixing it with a spoon. Same as with the pot, you’ll want to have a spoon you use only for dyes. Remember, dyes are not safe for consumption, so you do not want to use the same tools for dye as you use for food preparation. 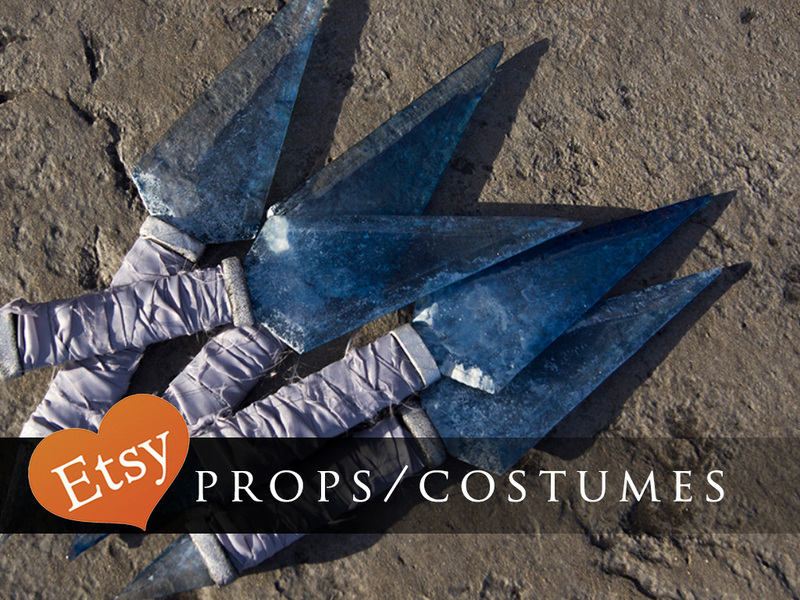 Then, take your wig, turn the cap inside out, so that the wig fibers hang from it, as seen in the far left picture below. Next, dunk your wig into the dye water and lift it back out immediately. You should see the wig take the color as soon as it hits the water. If it turns out you’ve used too much dye, you can always add more water into your pot to counteract it. I use too much dye at first and the gradient wasn’t going to be as subtle as I wanted it to be, so I added in enough water to bring the water level about halfway. I also used cold water, which cooled down the dye water and allowed the dye to take to the wig slower. Once I had added the extra water, the color was much lighter and allowed for a much more subtle gradient. 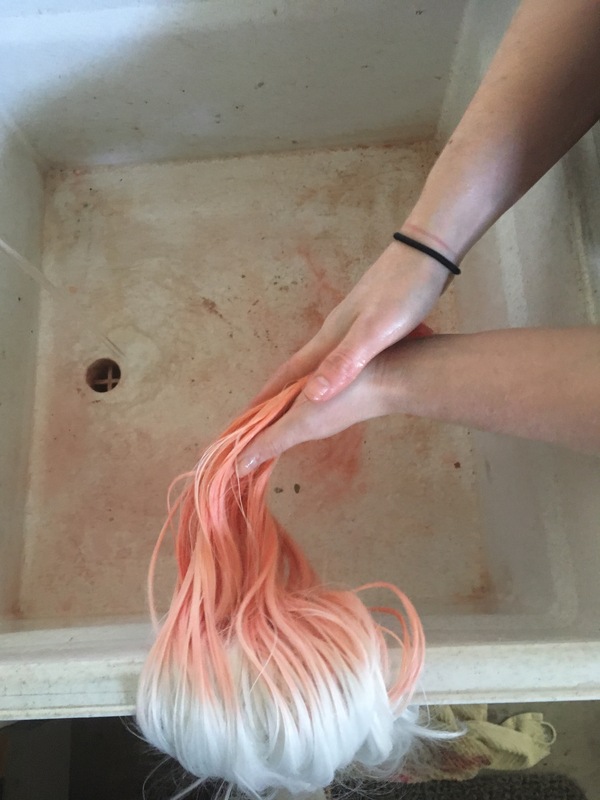 Remember, you can’t take the dye out of the wig once you’ve put it in, so if you dye it too dark, you’ll have add more water to your dye water and dunk the wig in deeper and deeper to get the gradient to even out. 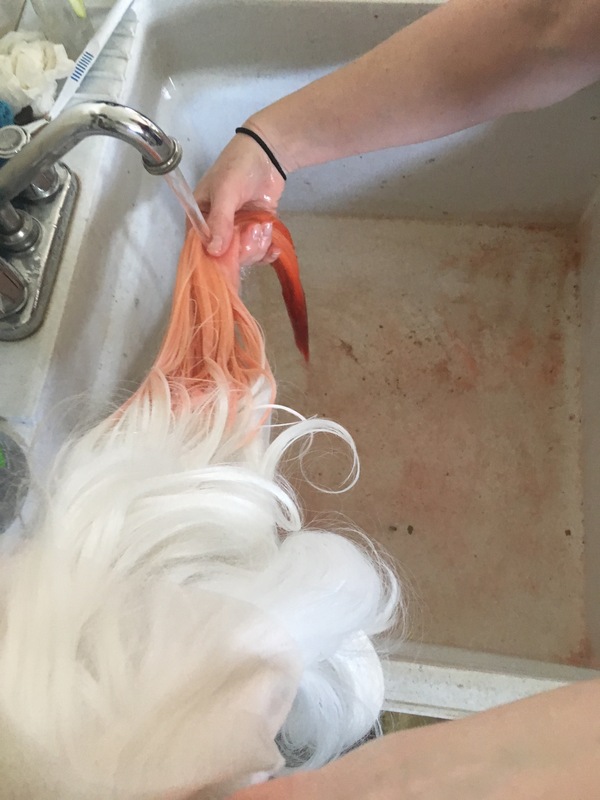 It can take some trial and error, so be very careful and test the dye out on a small, unnoticeable section of the wig first before dunking the whole thing in. To make the color gradient, focus more of the dye water lower on the wig fibers, and keep the wig moving up and down to avoid developing a harsh line. Below you can see what my wig looked like after a few minutes in the first mixture of dye water. The gradient is not very noticeable yet, so we have to keep working! Tip: use an old towel to lay your wig on when checking the color and mixing different dye/water ratios. It will keep your countertops clean! To continue my orange color gradient, I added a small amount of red dye into my orange dye water, while taking care to keep the dye mixture hot. Tip: It’s a good idea to leave the pot simmering or on low heat for the duration of your dyeing process. That way, your water won’t get too cool to work properly with all the dyes and water you add in! 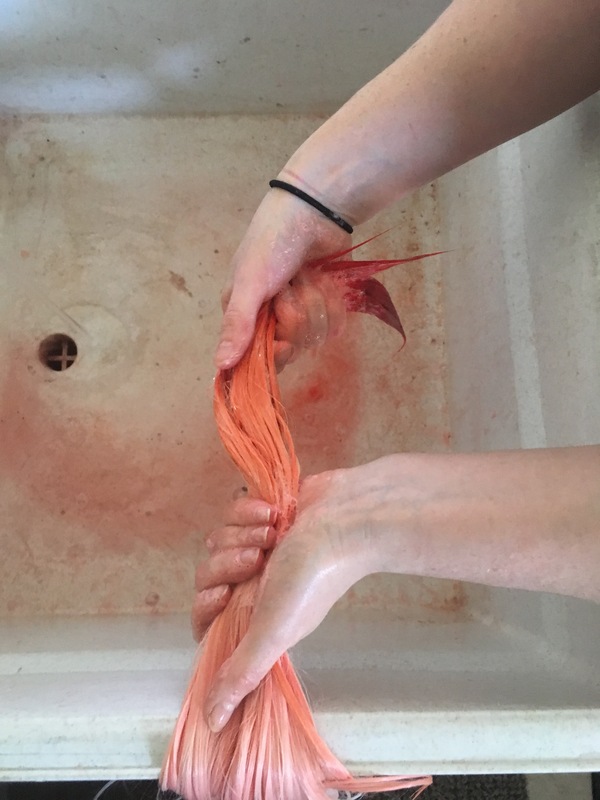 After adding and mixing in my red dye, I dunked the wig fibers into the new dye mixture, taking care to not dunk it as deep as I did with the lighter orange. Again, when dyeing with this process, be sure to keep your wig moving up and down so that you don’t get a harsh line! After dyeing for another minute or two, we can really see the gradient start to take effect! Step 5: Repeat, Repeat, Repeat! Keep repeating the same process as many times as you need with as many colors as you need. Since I’m just doing a light orange to dark orange gradient, I’m able to use the same dye water throughout the entire process while just adding in more dye as I go. If you’re doing more than one color (for example, a purple to blue gradient) you’ll need to dump out your first color, clean the pot, and start fresh with your second color. Once you’re happy with your gradient, its time to wash the dye out! First, rinse the wig out with cool water until the water runs clear. Then, take a small amount of liquid soap (I use dishwashing liquid) or shampoo and scrub the wig fibers gently. Last, rinse and repeat as necessary. You only nee to wash as far as the gradient goes, so if your gradient only goes halfway, you only need to wash that half. The last thing to do is simply let the wig dry. Since my wig was still dry on top, I was able to leave it on a wig head to dry overnight. If your entire wig is wet, you’ll need to hang it up so that the air flow can get up to the cap. Once its dry, you can style it as desired! Step 8: Restyle and Wear it! Unless your wig is supposed to be straight, you’re going to need to restyle it after it dries. Hot water will take out any curl or wave, so be sure to make to time put those back in! Below you can see my gradient wig in action! The orange hues were perfect for a Goldeen!